Quality beef and customer approved restaurant beef recipes ... a winning combination! For many years beef has been a staple at dinner time in America, whether at home or when dining out. A great deal of beef is still sold at the restaurant. Of the eight different grades of beef, try to use two for most beef recipes: "Prime" and "Choice." Please remember, regardless of the quality of the grade, some cuts of meat are naturally tenderer than others. They are in greatest demand and usually command a higher price than other cuts. Start with the right product and the right restaurant recipe, cook the beef as specified and you’ll end up with a fantastic tasting, healthy meal your family will remember for a very long time. And most methods of cooking beef are easier (and healthier) than many people think. Many of these real restaurant recipes don't take much time. For even more information about beef, read about beef. And if you are a "carb counter", please make sure you visit those recipes specifically designed for you. Just click the link. Breaking News! Many of these Real Restaurant Recipes are now available in e-book format or in beautiful, full-color 8X11.5 inch paperbacks! Just click here for more information. Roast Prime Rib! Elegant - Simple - Delicious! (AND a bit expensive, especially in November and December, so use this recipe for a very special day). Preparation time: 8 minutes (but 2 hours to cook). Serves 7-10 depending on portions desired. Burgundy Beef Strips. 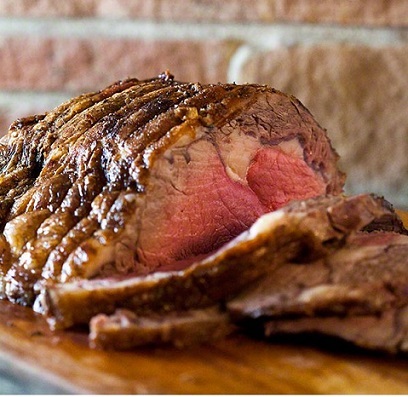 At the restaurant we most often use trimmed prime rib for this beef recipe but you can easily substitute any reasonable cut of meat graded "choice." Preparation time: 30 minutes. Serves 4. Blue Cheese Hamburger. This is a very tasty Blue Cheese Hamburger Recipe and easy to grill because you don't have to top the burger with blue cheese crumbles when grilling. The cheese is mixed in with the meat. Preparation time: 10 minutes. Makes 6 blue cheese burgers. Chicken Fried Steak - Country Fried Steak. Well this comfort food has two names - sort of. Either way, it is delicious. Preparation time: 15 minutes. Serves 2. Pot Roast - Comfort Food. 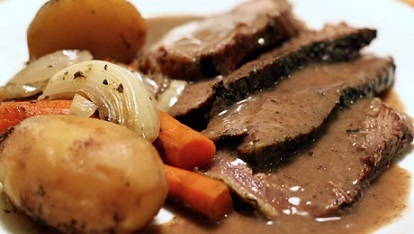 This Beef Pot Roast recipe is one of those all-time favorite recipes, what is often referred to as comfort food. Preparation time: 20 minutes. Serves 6-8. Beef Fajitas. A fajita is simply a meal with meat or poultry, vegetables, peppers and other ingredients cooked together and put into a flour tortilla. It is an easy meal to prepare and one of the tastiest meals you can make. Preparation time: 15 minutes. Serves 4-6. Hot Belly Buster Burger This Hot Belly Buster Burger is so-called because of the ingredients that include jalapeno peppers and Tabasco sauce and its size - 1/2 pound of beef. Preparation time: 10 minutes. Makes 8 burgers, 1/2 pound each. Secret Barbecue Hamburger Recipe.﻿ I must admit, I love hamburgers, including this barbecue hamburger recipe. Preparation time: 20 minutes. Makes 4 BBQ burgers. Beef Stroganoff This classic dish is named after a nineteenth-century Russian diplomat Count Paul Stroganov. Preparation time: 30 minutes. Serves 6. Corned Beef And Cabbage. Irish-Americans and lots of other people eat corned beef cabbage on St Pats Day, as a nostalgic reminder of their Irish heritage or in support of the Irish culture. They also prepare it because its delicious. Preparation time: 20 minutes. Cooking time 2 1/2 - 3 hours. Serves 8-10. Grilled Marinated Flank Steak. This recipe is perfect for summertime suppers. Preparation time does not incude the time needed for marinating. Preparation time: 10 - 15 minutes. Serves 4. Flank Steak - Another Delicious Recipe. Preparation time: 10 minutes. A 1 - 2 pound piece must marinade over night. Approximately 4 servings. Meatloaf. Meatloaf provides a great deal of flexibility in how you use it. The beef recipe calls for ground chuck (not ground beef). Preparation time: 20 minutes. 10-12 servings. 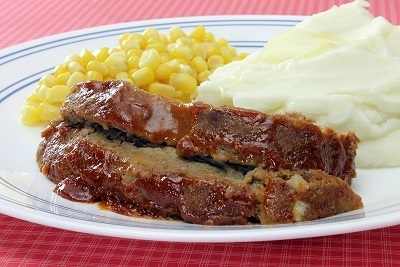 Bacon Cheeseburger Meatloaf. EVERYONE ...including the kids will eat this meatloaf! Serves approximately 12. London Broil. 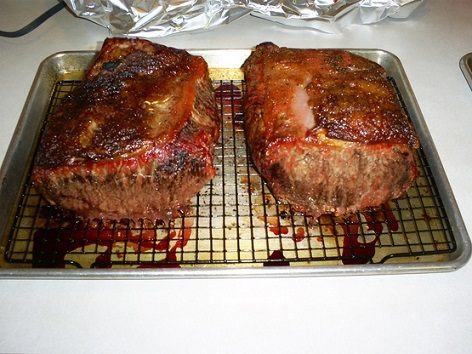 This London Broil Recipe is one of my husband's favorite ways to eat beef. It has always been a favorite restaurant recipe, too. Preparation time: 10 minutes. Enough to marinate 3-4 pounds meat. Beef Bourguignon. (A fun way of saying beef stew.) This delicious and versatile beef stew restaurant recipe "begs" to be enjoyed with lots of crusty bread and maybe a glass of burgundy wine! Preparation time: 3 1/2 hours because of slow cooking process. Recipe serves 8. Green Chile Beef Stew. This recipe calls for beef, but you can use pork, chicken or some game meats if you prefer. You can also leave meat out all together. Preparation time: 30 minutes. Makes 8 generous portions. Roast New York Strip Loin. 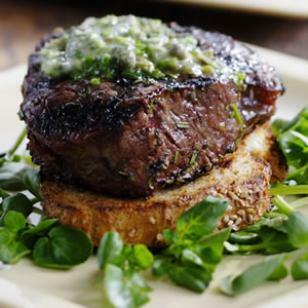 Roast New York Steak is an easy way to cook a delicious steak dinner for a group of guests. Preparation time: 30 minutes. Serves 6-8, depending on desired portion. Pasty Recipe. For those of you from the Upper Peninsula of Michigan or familiar with the U.P., guess what? I serve Cornish Pasties occasionally at my restaurant! This pasty recipe has been handed down from generation to generation. Preparation time: 25-30 minutes. Serves 4. Barbecue Hamburger Recipe With A Whiskey BBQ Sauce! This barbecue hamburger restaurant recipe works well anytime, but is one you may use most often during the summer grilling season. Preparation time: 15 minutes for the sauce and 15 minutes for the burgers. Serves 4. Hot Dog Recipes! - All Beef. The restaurant doesn't serve hot dogs on a regular basis. We do occasionally prepare them as part of the lounge menu when there are special sporting events on TV. (GO HAWKS) ;-) )But I like to serve them in a variety of ways, both at home and at the restaurant. Check the all-beef hot dog recipes out for your use at home. Grilled Steak with Brandy Butter. There are three secrets to this wonderful beef recipe: select a tender cut of beef steak, cook the beef to the exact doneness you like, and top the hot steak with the properly prepared brandy butter. Preparation time: 10 minutes. Serves 4, but you will have extra butter to freeze for other times and recipes! I always recommend using a meat thermometer to achieve perfection in getting the exact doneness you desire for your steak. 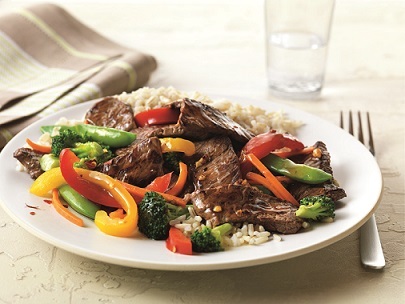 Need some vegetables and a starch to go with a beef recipe? Click on vegetables recipes to see ways the restaurant prepares them.